You can find a lot of conflicting information about cookware on the internet. You’ll find some bloggers advocating using nothing but cast iron while others rave on about the latest Teflon non-stick or Thermolon ceramic. Many internet personalities will mention their love of a certain type of material for cookware. This might be copper, stainless steel, or the aforementioned cast iron. Aluminum, on the other hand, doesn’t seem to get a lot of love outside of Circulon reviews. Frankly, this has always mystified me. While aluminum might not be as durable, easy to clean, or non-reactive as stainless steel, it’s one of the more important parts of a well-designed pot or pan. Almost all of the cookware in most kitchens relies on aluminum for the important task of moving heat from the hot burner to your cold food. 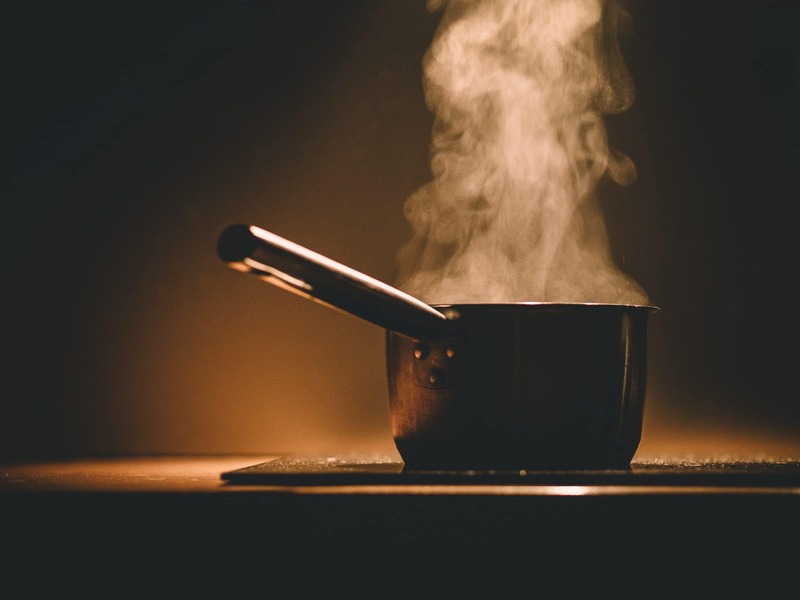 Without the inclusion of an aluminum disk in your stainless steel pots and pans, your food would take a very, very long time to heat up. Circulon specializes in the manufacture of pots and pans made predominantly from aluminum. In the mid 1980’s, a cookware corporation called Meyer created the Circulon brand in order to take advantage of promising new innovations. 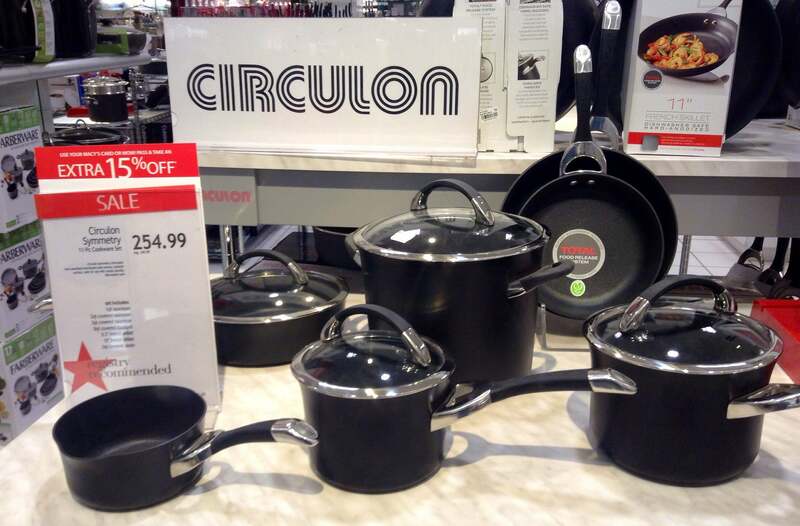 Circulon cookware featured non-stick surfaces that were paired with durable anodized aluminum pots and pans, making each piece of cookware light, inexpensive and very high performance. In addition to this marriage of materials, Circulon cookware also featured small circular ridges built into the cooking surfaces. Meyer claimed that these ridges helped improve food release and the longevity of the non-stick material. These days, Circulon is still doing the same stuff. Most Circulon lines, including Momentum, Symmetry, and Premiere, feature these same basic features. They’re made from hard anodized aluminum with modern non-stick surfaces and the signature Circulon ridges. You can find a few exceptions, however, including both regular aluminum and stainless steel variations on many of their more popular lines. So how does Circulon hold up these days? Let’s dive right in and find out. While Circulon produces a number of cookware lines these days, they’re mostly pretty similar. The big differences are the type of handles, the type of lid, and a few other minor details, including the exact materials used. When choosing a set, you should primarily look at the comfort of each pot and pan, the max oven-safe temperature, and whether or not a given line is compatible with an induction cooktop. Circulon commercial lines like Premier aren’t too different from the normal ones, so you can even find cookware targeted at professionals at about the same price. Momentum is one of Circulon’s newer lines. It’s a simple modern take on the classic ideas behind Circulon cookware. Momentum features simple hard-anodized exteriors, a modern non-stick coating with Circulon’s signature circular ridges, glass lids, and soft, silicone coated handles. This means it’s one of the better sets to choose for casual cooking in your kitchen. Of course, there’s a question that we should answer before comparing Momentum to Circulon’s other lines. 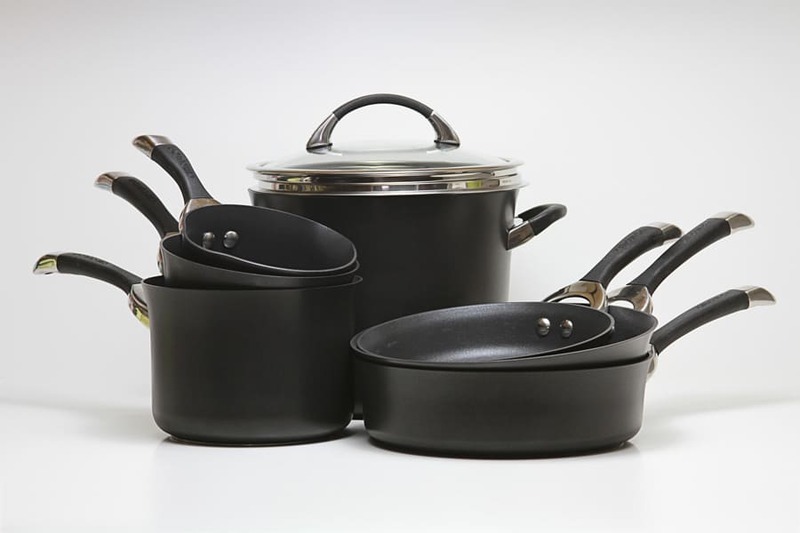 In order to answer this question for your kitchen needs and budget, we’ll take a quick look at what the role of anodized non-stick cookware is in the modern kitchen. First, let’s talk about the aluminum part. Aluminum is a lightweight, inexpensive material that has great thermal conductivity. This last part means that if you heat up one part of an aluminum disc (or pot), the rest of the disc will get hot fairly quickly. Aluminum is many times more thermally conductive than stainless steel. This means that a pot or pan that’s made primarily out of aluminum will heat up very quickly and quite evenly. That said, there are some disadvantages to aluminum. The first is that it’s reactive, which is a fancy way of saying that you can’t cook all foods directly on an aluminum surface. Luckily, with non-stick cookware, this isn’t a thing you have to worry about. Instead of touching aluminum, your food rests safely on a layer of non-reactive non-stick material. The aluminum in your pan never makes direct contact with the food. The second downside is that aluminum is soft. Again, this downside can be corrected for with proper construction. 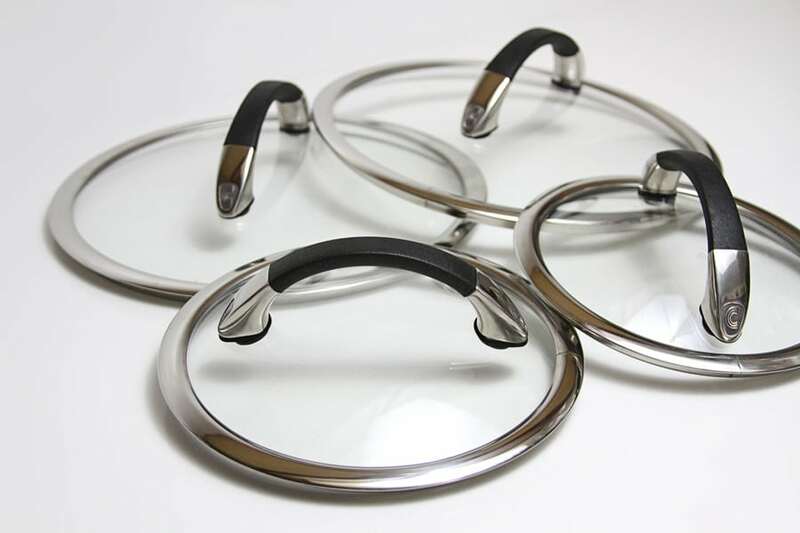 In the case of most Circulon lines, the cookware is treated with a process called hard anodization that makes the outer layer of the aluminum very strong. 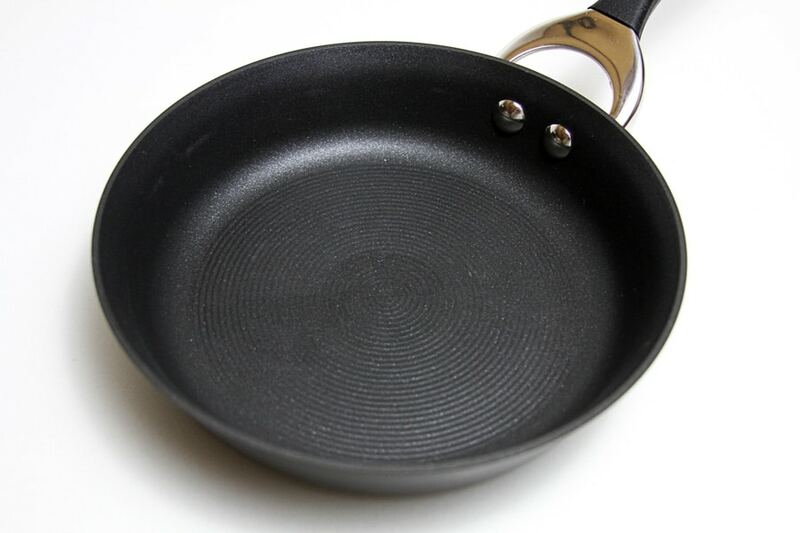 While anodization makes cookware durable, it doesn’t necessarily make it scratch resistant. Hard anodized cookware will start to look somewhat dinged up after a few years of use. I personally don’t consider this to be a big downside, however, for one simple reason: the non-stick will fail fairly soon anyway. This is one of those secret “truths” that cookware manufacturers really don’t like to talk about. All modern nonsticks — PTFE, Teflon, Ceramic, Thermolon, you name it — will wear out over time, especially with lots of use, improper care, or a combination of both. While you can stretch out the life of your non-stick pots and pans to several years, they’re almost certainly not going to last a decade. I tend to estimate that my pots and pans will have 2 years of effective use in my kitchen at most. While a couple of sets have defied my expectations and lasted for up to 5 years, they’re definitely the exception, not the rule. So does this mean you shouldn’t buy non-stick cookware? I think that you should, especially if you’re a casual home cook. The trick is to be smart about what you buy. An inexpensive set from a reliable brand like Circulon doesn’t cost a huge amount of money. While you might have to re-buy a similar set every two years or so, the upside is that you’ll always be cooking on fresh new cookware with incredibly effective non-stick surfaces. You also don’t have to worry as much about scratches on your cookware or accidentally breaking a pot or pan for whatever reason. Most importantly, non-stick offers the colossal advantage of letting you cook with a minimum of practice or effort. Just because some blogger can micromanage an over-easy egg with their well-buttered stainless steel pan doesn’t mean you need to do things the same way. This feat is only possible because of careful temperature control, a watchful eye, a practiced knowledge of when exactly to flip the egg, and plenty of butter. 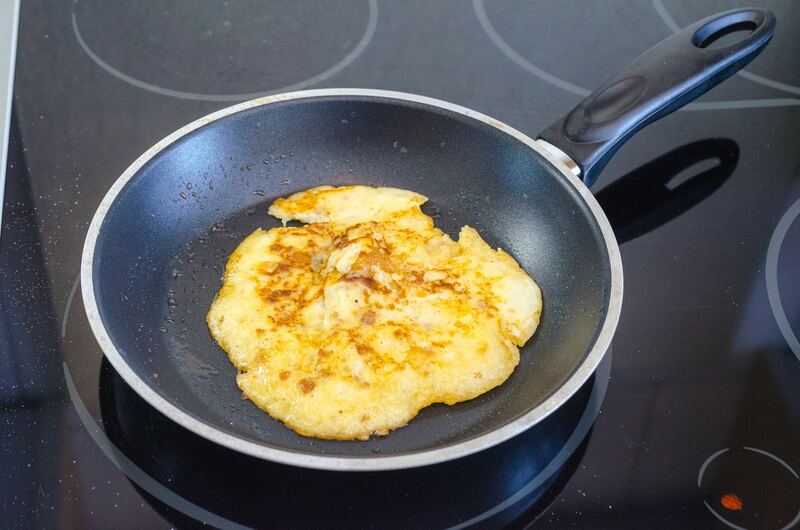 On a non-stick pan, you can crack an egg, set your burner to pretty much any temperature you want, flip the egg haphazardly, and even avoid cooking fat entirely. The egg still won’t stick. This gives you lots of room for learning, experimentation, and distractions in the kitchen. In other words, non-stick cookware means having to watch your kids while you cook won’t ruin as many dinners. Okay, so what does this mean in terms of Circulon cookware? The most important thing is that you need to be okay with potentially buying a new set of cookware in a couple years. Circulon has EXCELLENT warranty coverage on these pots and pans, but that doesn’t necessarily mean that they’ll replace them for free when the non-stick goes out. You should still expect to replace these in about 24 months on your own dime. If Circulon pulls through you’ll get to be pleasantly surprised and save a bit of money. If you’re not okay with replacing your cookware in two years, non-stick is probably not for you. Consider a low-cost stainless steel set from a brand like Kirkland or Cuisinart or spring for an heirloom-quality set from a brand like Demeyere. 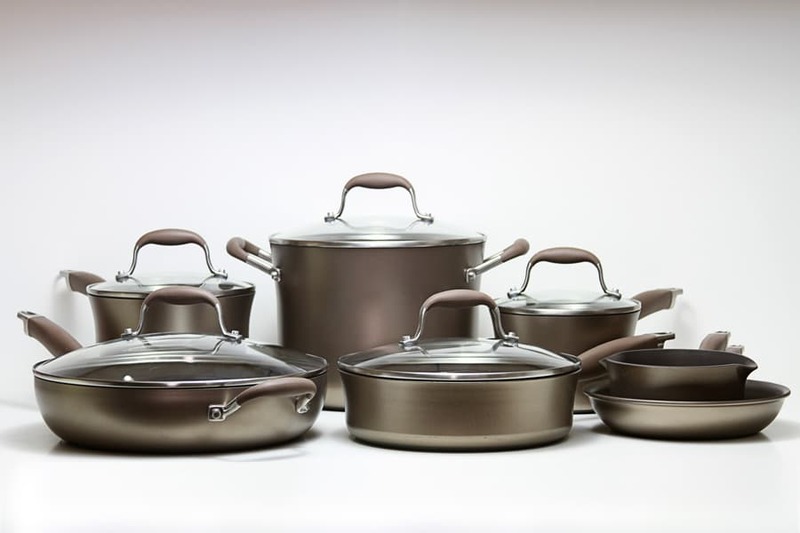 All-metal cookware sets routinely last for many decades and are often passed on to future generations. As far as quality goes, Circulon cookware is pretty good. The momentum line isn’t the heaviest thing in the world, but that’s a good thing. Each pot and pan is made with what feels like the right amount of aluminum. Less weight means more maneuverability as well as better heating characteristics, at least as far as responding to changes in burner temperature. Momentum is dishwasher safe. I want to be clear and state that it’s actually dishwasher safe, not “technically” dishwasher safe with hand-washing recommended. Circulon has designed their pots and pans with busy home cooks in mind. Not only will these stand up to repeated dishwasher cleaning, Circulon will also continue to honor their warranty no matter how many times you put your Momentum set through the dishwasher. This is quite a nice touch. The heating characteristics of these pots and pans are excellent, as you’d expect from the anodized aluminum construction. There’s a small downside caused by the lack of thermal weight in each pot and pan. This means that when you add cold food to a hot pan the pan gets colder at first. Luckily, the aluminum bodies of this cookware set heat up again quite quickly, but you may find that you want a cast iron pan for searing steaks at high temperatures and a few other specific tasks that require you to put cold food on a hot pan for very short lengths of time. Additionally, the non-stick coating in these pans is excellent. While I’m not totally sold on the ridges being a plus, they’re definitely not a minus. You can easily cook anything you want in these pots and pans without worrying about food sticking. If you’re fat-conscious, less experienced, or you simply don’t want to babysit each dish you cook, these non-stick pots and pans are perfect for you. But what about health? The non-stick coating in these pots and pans is extraordinarily non-reactive and PFOA-free. PFOA is a toxic chemical that used to be used in the manufacture of Teflon and other related nonsticks. Luckily, it’s been totally removed from the production process, enabling consumers to enjoy the advantages of non-stick cookware without major safety concerns. It’s worth noting briefly that the type of non-stick used in most Circulon cookware (including Momentum) will release a chemical that gives people headaches at fairly high temperatures. This means you should take the oven safety warning seriously and avoid cooking over high heat with your non-stick pans. Overheating your pots and pans will damage your non-stick coating, too, so try to limit things to normal cooking temperatures. The price of Circulon cookware puts it well within the reach of most households. While it tends to be slightly more expensive than the cheapest brands out there, Circulon cookware is reasonably high quality and comes with one big advantage in the form of generous lifetime warranties. Again, you shouldn’t expect these to give you infinite free replacements when the non-stick wears out, but you can count on Circulon to replace your cookware in the event of other damage. This includes manufacturer’s defects, damage caused by a dishwasher, faulty handles, and more. As far as convenience features go, this set (and most other modern Circulon sets) has you totally covered. My personal favorite feature these days is the inclusion of pour spots and colander lids, and the saucepans in this set feature both. This means you can stylishly vent steam out the side of your pot or strain pasta without using any extra dishes. It’s not a life-changing feature, of course, but it’s certainly nice to have. For me, this particular set is definitely one to consider. In my kitchen, non-stick cookware is predominantly used on the stove on lower heat settings, so the slight lack of oven safety caused by the glass lids and silicone handles isn’t a big deal. On the other hand, the quality construction, great heat distribution, and effective nonstick are big pluses, while the low price and excellent warranty help seal the deal. This is definitely a set to consider, especially if you can get it on sale. If you’d like a Circulon line that works on induction, however, or you’d prefer a bit more oven safety, keep reading! We’ve got more options to cover. Symmetry is a slightly older line that has one functional difference to Momentum. Rather than being made purely of aluminum, Symmetry pots and pans feature a magnetic stainless steel disk in the base that enables them to work on induction cooktops and ranges. Otherwise, however, the differences are just cosmetic. If you have an induction range, you think you might get one in the future, or Symmetry is cheaper for you, feel free to buy it over Momentum. For more information about Circulon Symmetry cookware, check out our in-depth review here. Circulon Infinite is quite comparable to Symmetry with two big exceptions: stainless steel lids and handles. These features make it a lot more oven safe and arguably a bit more durable. Just like Symmetry, Infinite is induction-compatible, making it a great choice for people with fancy new ranges. For more information about the Infinite line, check out our in-depth review here. The Premier Professional line is quite similar to Symmetry, although it’s marketed towards more serious chefs. It’s got soft handles, glass lids, induction-ready bases, and Circulon’s signature lifetime warranty. While it’s safe to treat the Premier line as the Symmetry line with slightly different looks, there are a few minor differences. Find out more in our in-depth review here. While I love non-stick cookware, I don’t necessarily think you need to buy it by the set. 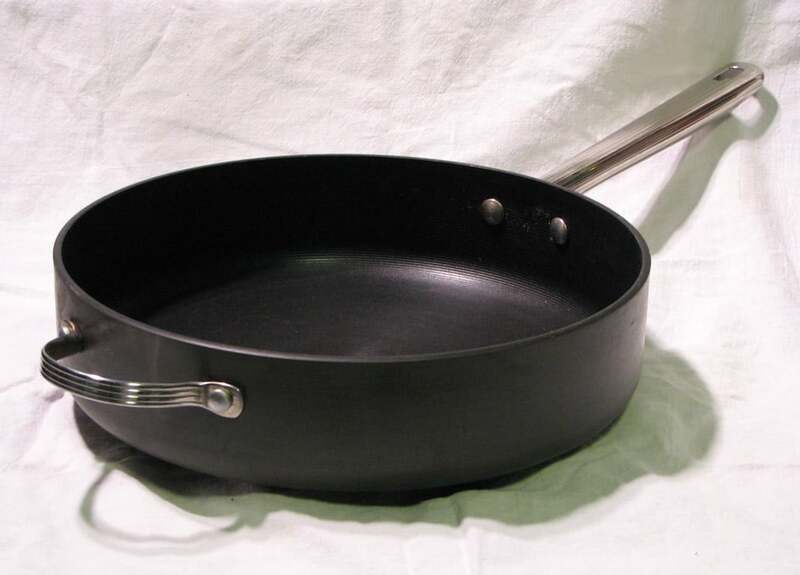 In many kitchens, non-stick cookware is simply used to supplement a durable stainless steel set. Alternately, your old non-stick set might not be wearing out at the same rate. Luckily, Circulon sells plenty of individual pieces for you to purchase. Here are some of my favorites. If non-stick cookware should be treated as disposable (and it should), three packs like this are a great bargain. If each pan in this set lasts for two years in your kitchen, this inexpensive three-pack will give you 6 years of frying eggs. You save a decent amount of money by picking up these pans in a pack instead of individually, especially given the size of the larger pan and the durable construction. Additionally, you get to take advantage of Circulon’s warranty for many issues. You can find sets of Circulon pans in many lines. This particular set happens to offer the best balance of price and features for my kitchen (I don’t cook eggs on induction and I prefer soft silicone handles), but it might not be the right one for yours. See below for an induction-compatible recommendation. My personal favorite Circulon saucepan at the moment is this Acclaim model. While it’s not induction ready, it’s got a glass lid to let you monitor your cooking more easily, a soft handle that won’t get hot while you cook rice or pasta, a pour spout to make managing liquids easy, and a lid that double as a colander. This saves you a dish and makes cooking many foods (like pasta, vegetables, and even some soups) much easier. The big downside to this particular pot is the lack of induction compatibility. You can easily find that in other Circulon saucepans, however, including this Symmetry saucepan. You’ll love how quickly this pot boils water on an induction range. For me, both of these options offer the right blend of performance, features, and price. If you’re in the market for a single saucepan, I highly recommend checking out these Circulon pots and other related models. 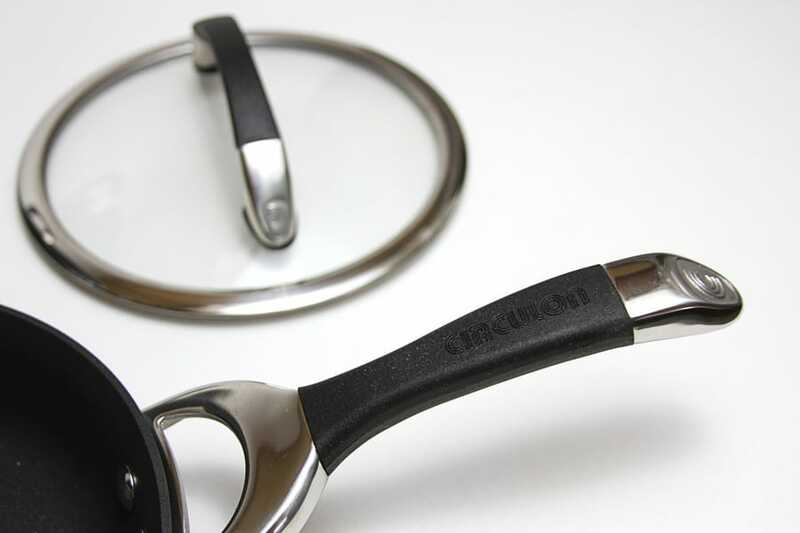 Induction cooktops work by using magnetic magic to literally generate heat inside of your pots and pans. This doesn’t work with aluminum, however, whether it’s hard anodized or not. This is because induction cooktops use magnets. Since aluminum isn’t magnetic, the cooktop simply ignores any pot or pan that’s made entirely from aluminum. This includes the Circulon Momentum product line. Many of Circulon’s modern lines feature magnetic stainless steel bases that enable them to work on induction cooktops. This set of two frying pans (10″ and 12″) is a great way to give yourself the tools you need to cook on an induction range. If you need pots, too (to take advantage of how quickly you can boil water on an induction cooktop, for example), check out the sets above. While Momentum isn’t induction compatible, the other three (Premier, Symmetry, and Infinite) are. You’ll get plenty of pots and pans with the lid and handle types that you prefer. While the basic ideas behind Circulon cookware haven’t changed much in the last thirty years, that’s because they haven’t needed to. We still need inexpensive non-stick anodized cookware that we can use for a few years before the non-stick wears out. Overall, if you’re looking for a set of nice but still cheap non-stick cookware, Circulon is a solid choice. Their dependable products, great warranties, and overall ease-of-use offered by their cookware all mean that you won’t regret your choice. You’ll still have to replace your set within a couple years, however. If you want something more durable, however, check out some of our other reviews that cover all-metal sets. Calphalon Vs Cuisinart: The Best Affordable Cookware? Starfrit The Rock Review: An Innovative Take On Nonstick? 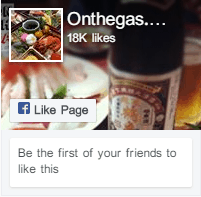 Peter's path through the culinary world has taken a number of unexpected turns. After starting out as a waiter at the age of 16, he was inspired to go to culinary school and learn the tricks of the trade. As he delved deeper, however, his career took a sudden turn when a family friend needed someone to help manage his business. 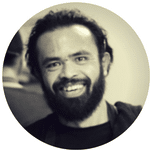 Peter now scratches his culinary itch on the internet by blogging, sharing recipes, and socializing with food enthusiasts worldwide.